Any peacock would be proud of these gorgeous designs to color. Many of the 31 dazzling drawings were inspired by traditional arts and antiquities as well as vintage wallpapers, mosaics, and pottery motifs, while others are all-original illustrations created by the imaginative artist Marty Noble. Illustrations are printed on one side of the perforated pages for easy removal and display. 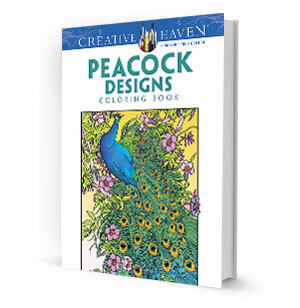 Makes a wonderful gift for a budding artist or coloring enthusiast.